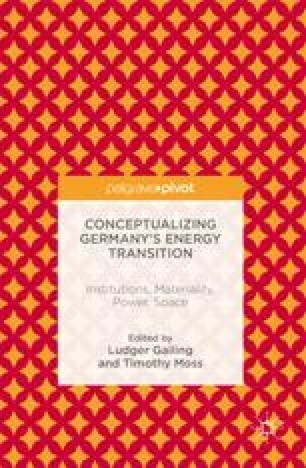 Germany’s energy transition (Energiewende) is highly instructive on how the shift from nuclear to renewable energy can reconfigure the institutional arrangements, power relations, socio-materiality and spatial structures of an energy system. This brief chapter sets the scene for subsequent empirical illustrations by characterizing the institutional framework of the German Energiewende, in terms of EU policy on liberalization and privatization, economic incentives for private investment in renewable energies and national government planning initiatives for grid development. From this, we identify the spatial dimensions of the Energiewende, drawing attention to processes of rescaling and decentralizing Germany’s electricity system. The chapter concludes by summarizing the principal research challenges for social scientists working in this under-theorized field. AG Energiebilanzen e.V. 2014. “Bruttostromerzeugung in Deutschland ab 1990 nach Energieträgern.” Accessed January 20, 2015. http://www.ag-energiebilanzen.de/index.php?article_id=29&fileName=20141216_brd_stromerzeugung1990-2014.pdf. Agora Energiewende. 2013. “12 Insights on Germany’s Energiewende.” Accessed March 8, 2013. http://www.agora-energiewende.de/fileadmin/downloads/publikationen/Agora_12_Insights_on_Germanys_Energiewende_web.pdf. Buchan, D. 2012. The Energiewende – Germany’s Gamble. Oxford Institute for Energy Studies. Accessed February 5, 2015. https://www.oxfordenergy.org/wpcms/wp-content/uploads/2012/06/SP-261.pdf. Gailing, L., F. Hüesker, K. Kern, and A. Röhring. 2013. Die räumliche Gestaltung der Energiewende zwischen Zentralität und Dezentralität. Explorative Anwendung einer Forschungsheuristik. Leibniz-Institut für Regionalentwicklung und Strukturplanung, Erkner. Accessed January 10, 2014. http://www.irs-net.de/download/wp_energiewende_raum_zentral_dezentral.pdf. Geden, O., and Severin Fischer. 2014. Energiewende under Siege: German Energy Strategy under Threat from EU “Paradigm Shift”. Accessed February 4, 2015. http://www.energypost.eu/eu-post-2020/. Moss, T., S. Becker, and M. Naumann. 2014. “Whose Energy Transition is It, Anyway? Organisation and Ownership of the Energiewende in Villages, Cities and Regions.” Local Environment (May 2014). doi: 10.1080/13549839.2014.915799.